Update: This is entirely wrong. Urk. The amazing thing is that the guys churning out regular additions to these four games are half of Valve. The other half are working on Steam, constantly. Seventy-five people. There’s certainly enough in the pipeline to occupy them: Steamworks, Steamcloud, matchmaking, minimum requirement checks, ongoing Community improvements, non-game/driver downloads and a P2P network to name merely what we peons know of today. One of the things we’d like to do is to understand what types of applications people have on their PCs. For example, if a whole bunch of people are running Firefox, then make sure that’s one of the applications they can get through Steam. [Then] there are community features that we want to continue to add. There’s peer-to-peer functionality: the community has this tremendous amount of bandwidth. There’s a whole bunch of content that they’re downloading right now, and being able to replicate that throughout the community using peer-to-peer would be a really good idea. What they need is a structured interface on top of that so they can find the content that everybody’s already downloading. Those are the kind of things we’re looking at. 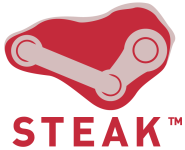 Other Tom goes on to talk about how he expects Steam to become practically an OS of its own within Windows one day, and it’s getting harder and harder to disagree with him.